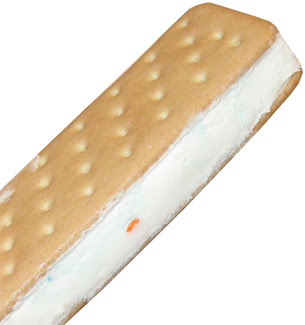 What we have is a standard size ice cream sandwich with birthday cake ice cream. It's hard to tell in the picture, but there is a blue frosting streak in there. Well, technically it's hard to taste it in particular as well, but that's not really a big deal. What you have is a half decent birthday cake flavored ice cream in between two vanilla wafers. I think the wafers keep us from going too deep into that overly sweet frosting flavor that plagues so my birthday cake ice creams. The confetti sprinkles are there for color, so don't worry about crunching on anything hard. Overall, it's not bad. I don't foresee myself buying any more of these unless I was having a bunch of kids over for a birthday party on a hot summer day. I'm sure kids and parents would be more than happy to give these a try on just such an occasion. Update: In 2013, these got 30%. There is an updated review here.